There are over 612,000 bridges in the United States and as of February 2017 almost 10% of them need to be repaired or replaced according to The American Road and Transportation Builders Association. That means that there are currently over 55,000 bridges that require real-time monitoring in order to avoid a catastrophe like the 2007 bridge collapse in Minneapolis, Minnesota. Resensys offers cost-effective and scalable solutions to help assess the structural stability of these and other highway bridges so that structural issues are pinpointed and necessary maintenance and repairs can be planned to ensure bridge safety and longevity. Their wireless structural health-monitoring solution, SenSpot™, is for existing bridges and bridges under construction and features small, low-cost, easy-to-install wireless sensors that measure a variety of variables affecting the performance of a bridge. Born from the research conducted by President and CTO Dr. Mehdi Khandani at the University of Maryland, Resensys is a leader in real-time geostructural monitoring and offers the most durable wireless bridge monitoring system with a minimum expected lifetime of 10 years. For more information visit http://www.resensys.com. Although there are other sensors on the market for monitoring infrastructure, what differentiates a Resensys device is its ultra-low power consumption, using only about 4 microwatts, or roughly 100 million times less than a typical lightbulb. This means that a SenSpot sensor has a minimum lifespan of 10 years using only a small ½-AA battery. In order to offer such an efficient and accurate monitoring system, Resensys needed to find a tilt sensor with a resolution of up to a thousandth of a degree while also offering low power consumption, durability, and a product lifetime of at least 10 years. Dr. Khandani and his team thoroughly evaluated a variety of MEMS and other electrolytic tilt sensors, and concluded that the Fredericks TrueTILT™ Single-Axis Narrow-Range Electrolytic Tilt Sensor (PN 0703-0711-99) significantly outperformed competing products in terms of long term repeatability and resolution. 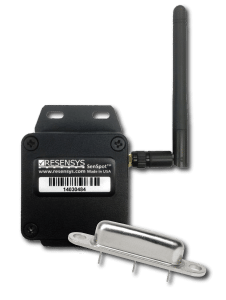 With the help of Fredericks’ electrolytic tilt sensors, Resensys is able to offer the world’s most energy efficient wireless monitoring solution that helps keep travelers safe with around 5,000 SenSpot™ tilt units in use in the US and around the world. In the Spring of 2014, cracks were spotted in the girders and piers of the I-70 Patapsco River Bridge near Baltimore, Maryland. Engineers found that non-responsive bearings had cause damage to piers and steel girders of the bridge, which led to its closure in June 2014. Repairs were made, retrofits were applied, and a SenSpot™ monitoring system was installed in July 2014 to detect any further changes. More than 40 SenSpot™ units were mounted on the bridge, including 12 tilt sensors located on the bridge’s rocker bearings to monitor the movement pattern and detect non-responsiveness or over-responsiveness. In addition, six high resolution tilt sensors were mounted on the bridge’s piers to monitor deflection and rotation of the bridge rocker bearings caused by cold temperatures. Early results from August to November 2014 found that the bearings on two piers were non-responsive to temperature changes and an additional bearing saw only 20% of expected movement. Data collected through Spring 2015, however, showed that the bearings had an unprecedented response to the robust retrofits (combined with an especially cold winter), and by March 2015 all piers and respective bearings were fully responsive. Prior to February 2015, the bearings and retrofits weren’t responding properly to changes in temperature, but by mid-Spring they proved to be fully responsive and have seen continued success in the years since. Before alerting the Maryland State Highway Administration, the Resensys team worked with engineers at Fredericks to confirm the data. At Fredericks we take a partnership approach to our relationships with customers, and customer satisfaction is a priority. We have dedicated representatives and engineers committed to providing highly responsive service, and our customers have anytime-access to our leadership team, made possible in part by our “not too big, not too small” operation.